ABSTRACT: Diatoms were obtained on three different circumstances, sea-ice, sea-water, and diatommat samples, at four different locations in the central Arctic Ocean during August and September 2004. One hundred twenty diatom taxa belonging to 38 genera, 14 of which were centric and 22 of which were pennate, were recognized in these samples. Even within the same circumstances, the diatom community exhibits changes through time. The genus Chaetoceros Ehrenberg 1844 (mainly C. sociale Lauder 1864) showed high relative abundance (>90%) in sea water samples collected on 25 August and 7 September, whereas Chaetoceros species were rare or absent in each of the samples collected on 12 and 14 August. In the samples of 12 and 14 August, diatom assemblages showed higher diversity than the samples of 25 August and 7 September. 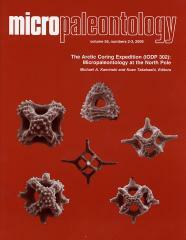 Pennate diatoms such as genera Fragilariopsis Hustedt in Schmidt 1913, Navicula Bory de Saint-Vincent 1822, and Nitzschia Hassall 1845, were common in the samples of 12 and 14 August.